That’s how Eve L. Ewing opens Ghosts in the Schoolyard: describing Chicago Public Schools from the outside. The way politicians and pundits and parents of kids who attend other schools talk about them, with a mix of pity and contempt. But Ewing knows Chicago Public Schools from the inside: as a student, then a teacher, and now a scholar who studies them. And that perspective has shown her that public schools are not buildings full of failures—they’re an integral part of their neighborhoods, at the heart of their communities, storehouses of history and memory that bring people together. Never was that role more apparent than in 2013 when Mayor Rahm Emanuel announced an unprecedented wave of school closings. Pitched simultaneously as a solution to a budget problem, a response to declining enrollments, and a chance to purge bad schools that were dragging down the whole system, the plan was met with a roar of protest from parents, students, and teachers. But if these schools were so bad, why did people care so much about keeping them open, to the point that some would even go on a hunger strike? Ewing’s answer begins with a story of systemic racism, inequality, bad faith, and distrust that stretches deep into Chicago history. Rooting her exploration in the historic African American neighborhood of Bronzeville, Ewing reveals that this issue is about much more than just schools. Black communities see the closing of their schools—schools that are certainly less than perfect but that are theirs—as one more in a long line of racist policies. The fight to keep them open is yet another front in the ongoing struggle of black people in America to build successful lives and achieve true self-determination. Eve L. Ewing is assistant professor at the University of Chicago School of Social Service Administration. She is the author of Electric Arches, and her work has appeared in the New York Times, New Yorker, Atlantic, Washington Post, and many other venues. She was born in Chicago, where she still lives. "If only for widening the scope of the debate over public schools, Eve Ewing’s new book is a welcome entry to the conversation. Rejecting the impulse to see education as disconnected from American life and politics, Ghosts in the Schoolyard links the struggles of Chicago public schooling with the city’s notoriously racist housing practices. Ewing peels back the seemingly anodyne messaging of reform ('school choice') and its ostensibly objective standards ('test scores') to reveal the insidious assumptions lying beneath. Perhaps most importantly, Ewing gives direct voice to those served by those schools often dismissed as failing. What she finds is that these schools are often among the last working institutions in neighborhoods which have been systematically stripped of everything else. Mixing history, sociology, and even memoir, Ghosts in the Schoolyard is an important addition to any conversation about the future of public schools and those they were designed to serve." "What makes this book more than an inflated explainer on racism and school closings is Ewing’s analytic methods, and in particular how eager she is to share them with the reader. The choices she makes, both as a writer and as a sociologist, are well considered and explained in the text. . . . Ewing is less interested in showing off the depth of her reading than in convincing us that theory is more aligned with our experiential knowledge than we might otherwise think. One of the clearest signs of her lack of egotism is how willing she is to cede analytic insight to the people in her community. . . . Ewing’s mission is to present critical theory and sociology in a way that makes her readers feel capable of enacting both." "This superbly written and researched account is at once poignant and deeply troubling, blending the personal and the academic in a way that makes the heavy subject matter accessible. Ghosts is essential reading for anyone trying to better understand the intersection of segregation and education--as well as the importance of preserving the public institutions that help shape communities." "Two questions permeate this study: 'If the schools were so terrible, why did people fight for them so adamantly?' and 'What role did race, power, and history play in what was happening in my hometown?' . . . The deeply moving final chapter addresses the Bronzeville community’s sense of mourning in the loss of 'institutions, like our schools that have helped shape our sense of who we are.' Ewing's work, a tribute to students, parents, teachers, and community members, is essential for general readers confronting the issues of 'school choice' and school funding, as well as useful for historians of the African-American experience." "The best book about education this year. . . . The book reads like a novel. . . . Let me add that I have waited for this book for a long time, not knowing if it would ever be written. History told from the point of view of those who were acted on, rather than the point of view of those at the top of the pyramid. Whose story will be told and who will tell it? Eve Ewing has told it. . . . I found it difficult to put down." "Ewing is a Harvard-trained sociologist as well as a poet and an educator (among other things), and this comes through in her lively and accessible writing." ,"A powerful account. . . . Ewing's book thrums with an activist's outrage. . . . Ewing gracefully melds reportage, heartbreak, ire and history in a book that showcases the city’s education and racial tensions as a microcosm for the nation’s amalgamated woes." "A chilling must-read investigation of racism in Chicago’s education system. . . .In addition to its poignant content and touching cast of characters, this book is technically superb. Ewing’s crisp prose is succinct and inviting, never lacking in energy. This book never backs down from critiquing the housing, education, and legal systems that contribute to the plight of certain communities in Chicago. . . . Eve L. Ewing's Ghosts in the Schoolyard deftly details a microcosm of a larger picture where some people’s freedoms are much more complicated than others." "Bracing. . . . Most important, this book effectively connects school closings in largely African American neighborhoods to the devaluation of black lives in general. Ewing's graceful prose enlivens what might otherwise be a depressing topic in this timely, powerful read. Recommended." "'A fight for a school is never just about a school,' Ewing notes in her bracing account . . , relying on a blend of historical and ethnographic research to show how the closures were only the most recent manifestation of a decades-long pattern of disinvestment by Chicago Public Schools. . . . Ewing's graceful prose enlivens what might otherwise be a depressing topic in this timely, powerful read. Recommended to public, high school, and university ­libraries." "Ewing masterfully illuminates the alternate realities, histories, calculations, and languages that were at play in closing dozens of predominately Black schools in Chicago. Those schools now reside in the ghostly world, and Ewing acts as a keen shaman, reminding us of what has been lost and instructing us on how to value Black children's education going forward. A powerful book on so many levels." "In Ghosts in the Schoolyard, Eve Ewing dramatically uncovers the deleterious effects of school closings in the Chicago inner-city community of Bronzeville. With noteworthy prose, this powerful research study illuminates the role of implicit racism, segregation, school policy, and housing policy in school closings and their subsequent impact on students, parents and teachers. Ewing's revelatory analysis is a must-read for anyone concerned about the future of urban communities, especially the public schools populated with students of color." 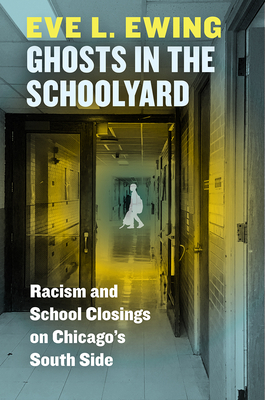 "Ghosts in the Schoolyard is an engaging, critical, and accessible analysis of the Chicago Public School closings. With brilliant analysis and beautiful prose, Eve Ewing lends a window into the local and national political struggles, historical processes of marginalization and isolation, and contemporary market logics that have produced the current educational moment. Equally important, Ewing never loses track of the various ways that students, teachers, and parents have resisted the processes and discourses of school closing. This is a rare and urgent text that should be read by scholars, parents, teachers, and students alike." "In Ghosts in the Schoolyard, we listen to the anguished and angry voices of parents, teachers, students, and community members who expose the currents of deceit, shaming, and racism that are embedded in the bureaucratic language and metrics that seek to rationalize the school closings on Chicago’s South Side. In this heartbreaking and revelatory narrative, Eve Ewing is the disciplined observer, the generous witness, the probing analyst, and the soulful poet who hears the grieving and the grace in their 'institutional mourning.'" "Ewing's refusal to forgo structures for people, or people for structures, is what makes this book incendiary."